Welcome to your new home in Cambria. This home is located at "The Top Of The World" with panoramic views of the Santa Lucia Mountain Range. The main home features upstairs a open concept living room with a gas fireplace and deck with views off the kitchen and the living room. There is also a bedroom/office with deck and bath upstairs. The downstairs feature the master en-suite with a gas fireplace and a deck with views. The guest room, bathroom, laundry room and 2 car garage are also located on the lower level. This home has 4 decks, tons of storage, lots of windows which make this home bright, light and airy. 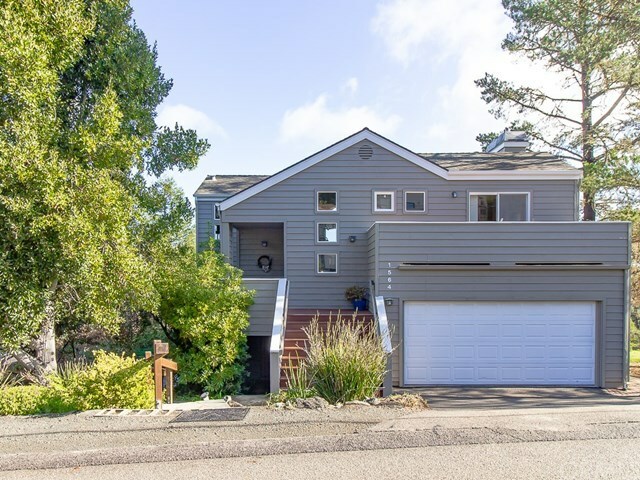 As you meander down the stone path on the north side of the home you come to another 2 car garage with a cute cottage on top of the garage with it's own deck. The cottage features a bathroom, 2 closets, loft, window seat, wood floors, tile floor in bathroom, sink, storage and mini fridge. Lots of windows also makes the cottage light, bright and airy. The home also includes 2 lots adjacent north of the main home, which gives you a feeling of privacy. There are 6 lots with 3 APN's for this wonderful property, 024-281-018, 024-281-017, 024-281-011. This is a one of a kind property and very well cared for. Directions: From HWY One going north go left on Ardath, then left on Spencer. House is on the left hand side.